More than 44 million Americans currently have student loans. For the vast majority, this investment paid off and they are successfully managing their loans. For some, though, the educational experience and investment did not produce the desired outcomes. At Navient, our priority is to help each of our 12 million customers successfully manage their loans in a way that works for their individual circumstances. Customer feedback — like that gathered through our own research or submitted through the U.S. Department of Education or the Consumer Financial Protection Bureau (CFPB) — is important to guide our outreach — outreach that is the foundation of our industry-leading practices to assist struggling borrowers to avoid delinquency and default. We also use this feedback to enhance our servicing, drive innovation, and inform policy recommendations aimed at improving customer experience and outcomes. The CFPB began offering consumers with private education loans a mechanism for feedback in 2012 with the launch of its consumer complaint portal. The portal’s use was expanded in 2016 when the CFPB began accepting feedback from consumers with federal student loans — which comprise 93 percent of outstanding loans. To shed light on the most frequent topics behind the numbers, we conducted an analysis of complaints filed by Navient customers via the CFPB portal — both federal and private — for federal fiscal year (Oct. 1, 2015-Sept. 30, 2016). 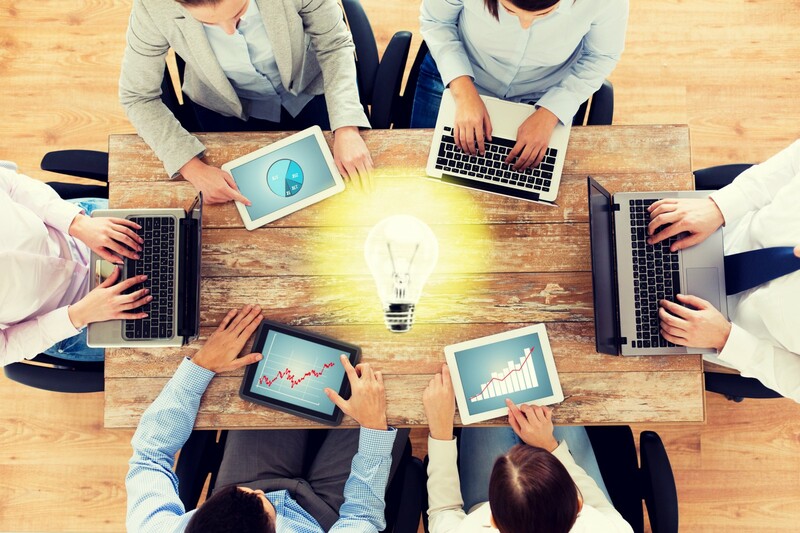 We reviewed each submission and researched the underlying account history. 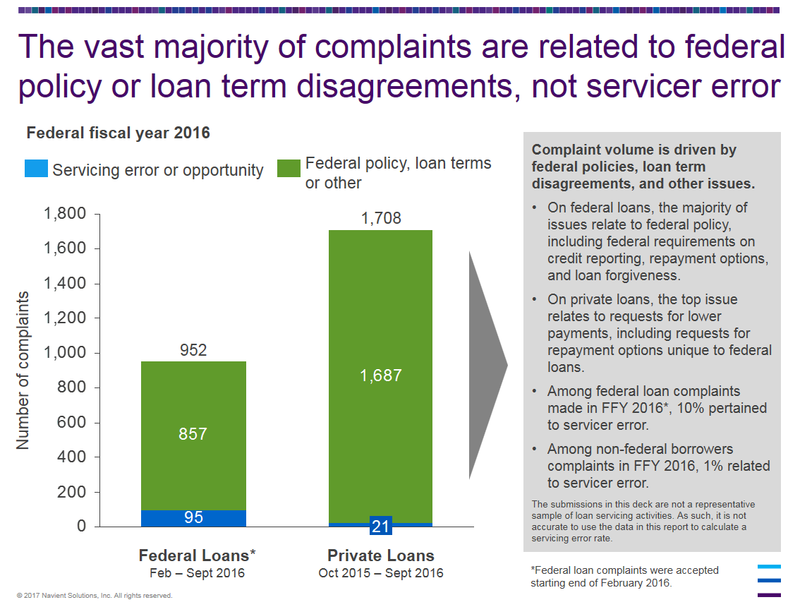 The vast majority of complaints — approximately 90 percent — relate to federal loan policies, disagreement with loan terms that were set at the time the loan was made, or other issues unrelated to servicing errors. For instance, the number one reason for complaint submissions by federal loan customers was requests for “courtesy” retractions of delinquency from their credit report, something not permitted by law. In fact, Navient has recommended changing federal law to allow lenders and servicers to accommodate these borrower requests in certain instances. For private loans, the top complaint relates to requests for lower payments, including requests for income-driven repayment plans that Congress made available on federal loans. While many comments revealed helpful ways Navient can improve our outreach and engagement efforts, others exposed the consequences of an overly complex student loan system in need of reform. Allow a courtesy credit bureau fix. As stated above, the top reason for complaints from Navient federal loan borrowers (17%) is a request to delete records of previously missed payments from credit bureau reports. Navient has recommended that servicers be allowed to grant a courtesy removal of adverse credit bureau information once a borrower establishes an on-time payment history. A change in federal law would enable Navient and other servicers to fulfill these requests. The second most common category for federal loan complaints (16%) is about repayment options, including instances where borrowers had not yet completed application paperwork, or their application processing was underway within the 15-day Department of Education standard. Navient has long advocated for simplifying IDR, including allowing phone and multi-year enrollment. Federal policy changes to streamline IDR enrollment would resolve a great deal of frustration for federal borrowers who wish to reduce their monthly payments by tying their monthly payments to their income. Better upfront information before borrowing. Several concerns expressed by federal and private loan borrowers alike point to the need for stronger financial knowledge about how interest works and the likely value of education at a given school or field of study. To make informed decisions about postsecondary plans before taking out student loans, borrowers need access to better information about program outcomes and the total cost of their education. The top two complaint categories expressed by private education loan borrowers are inability to make payments (21%) and, once payments are missed, dissatisfaction with call attempts to speak with a borrower or cosigner (14%). We understand that borrowers — both private and federal — can go through periods of difficulty. However, among the small percentage who end up defaulting on their loans, many have not spoken with us. In 2009, we became the first in the industry to voluntarily create a private education loan modification program. This program lowers the interest rate for struggling borrowers, resulting in a lower and more affordable monthly payment to assist customers through temporary financial hardship. Today, more than $2 billion in private loans are enrolled in the program. On federal loans, income-driven repayment options offer assistance. However, we cannot assist borrowers with these options unless we can speak with them. We need more voices encouraging student loan borrowers to engage with their servicers to ensure they are aware of their options to avoid delinquency and default. Create additional pathways for relief. We recognize that some student borrowers face long-term financial challenges. This is why, for several years, Navient has recommended bankruptcy reform that would allow federal and private student loans to be dischargeable in bankruptcy after making a good-faith effort to repay. In addition, we have supported creating a private education loan rehabilitation program similar to the federal program. To be clear, customer feedback, including comments received through the CFPB complaint portal, is an important tool in helping us improve the way we work with borrowers. When we receive a customer inquiry through the CFPB portal, our consumer advocates reach out individually to each borrower to get more details about their situation and work to resolve the issue. Navient has responded to all customer complaints filed since the portal launched in 2012. Our analysis shows how much need there is for federal policy updates to improve the student loan experience. However, it also shows there is room for improvement in servicing. When we find an error, we fix the customer’s account, identify and fix the root cause, and use the feedback to make updates and enhancements to our programs to better serve others. For example, we added the option to schedule appointments with a repayment options counselor at a time convenient for the customer, overhauled our customer website to make it easier to navigate, created more visible reminders for payment plan deadlines, created a specialized team to serve military customers with their unique needs, sped up payment processing times, and added functionality to more easily direct payments to preferred loans. Earlier this month, we launched Navient Labs, a digital lab to demonstrate ways that design and technology could better help borrowers understand the impact of lower payments on life of loan costs and otherwise reimagine the student loan experience. We will continue to enhance our servicing through technological innovation and specialized teams to ensure our customers can more easily manage their student loans. It is in this spirit of reform that we share this analysis to help policymakers establish priorities for enhancing student loan borrower success. As a nation, we have a vested interest in ensuring consumers who are looking to better themselves through education realize their investment. We look forward to working with policymakers to make these reforms come to life. Jack Remondi is the president and CEO of Navient, a Fortune 500 company that provides asset management and business processing solutions to education, healthcare, and government clients at the federal, state, and local levels. The company helps its clients and millions of Americans achieve financial success through services and support. Jack Remondi is president and CEO of Navient, an asset management and business processing company that helps millions of people achieve financial success.